Active Components: The active components which are responsible for guarana’s actions are theophylline and theobromine, which belong to alkaloids, as well as guaranine, which is highly similar to caffeine in its characteristics. As similar to caffeine, guaranine is responsible for stimulating the nervous system, enhancing metabolism, and promoting urination. According to one research, guarana poses no side effects on human mind and psychological state. Caffeine is stated to produce negative impact on the circulatory system and other organs, in addition to preventing fetus development, and guaranine is thus characterized by the same properties. Guarana is rich in tannins, which can be applied as a remedy for diarrhea. 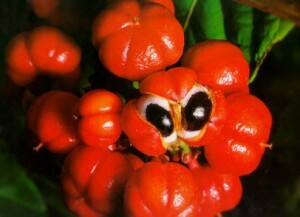 History: The residents of rainforests in Amazon applied pounded guarana seed as a medication and as a common drink. In addition to its nutritional and energizing properties, guarana is stated to relieve diarrhea, reduce tiredness, suppress appetite and treat arthritic conditions. It was additionally applied to treat alcohol withdrawal symptoms and relieve pains, associated with menstruation. The herb gained its popularity in Europe after a French physician brought it from Brazil. It was then used to relieve migraine and headaches, associated with anxiety, neuralgia, urinary irritation, paralysis, and other conditions, in addition to being employed as a treatment for diarrhea. Used For: The herb is highly beneficial for tiredness, obesity, and decreased athletic performance. Guarana’s treating capacity depends predominantly on its caffeine concentration. Its caffeine content is 2.5 times more than in coffee. Probably, due to this reason it is so efficient in decreasing migraine headaches. Tannins, found in the herb, are responsible for its astringency. Guarana medications are stated to reduce blood clotting, taken either orally, or in form of vein injection. Additional Info: The largest share of guarana’s world population is cultivated in the northern areas of Brazil. Guarana paste or gum is produced from its seeds and applied in herbal medicine. Preparation and Intake: To make an infusion, take 1-2 grams of pounded seeds or resin for a cup of cold water, then boil up and leave on low heat for ten minutes. The result is taken thrice a day. Guaranine content in each cup is nearly 50 mg.
Safety: Due to its caffeine content, guarana may lead to hyperactivity, urinary frequency, palpitations, anxiety, trembling, and insomnia. Pregnant or breastfeeding women should not use guarana. Prolonged application may result in reduced fertility, several types of cancer, and cardiovascular disease, as stated by caffeine researches.